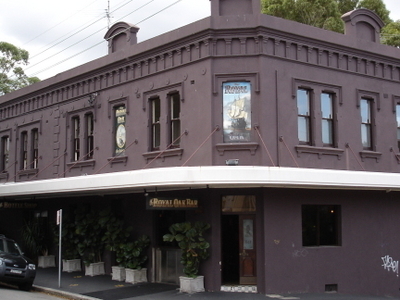 The Royal Oak Hotel is a pub in the suburb of Balmain in the Inner West of Sydney, in the state of New South Wales, Australia. The pub has historical links with the union movement and is one of a number of buildings which formed an integral part of the shipbuilding and industrial history of the local area. The land on which the pub currently stands was part of a much larger 550 acre (2.2 km²) grant to colonial surgeon Dr William Balmain made in 1800 by Governor John Hunter. The hotel was established in 1878 as Hollis's Hotel under publican George Hollis. In 1884, J W Clifford became publican, renamed it to the Clifford Family Hotel and refitted the hotel in 1886. A further change of ownership took place again in 1888 when William Coates renamed the pub Coates Family Hotel. Thomas Hunt gave the pub its current name after taking over in 1898. The Royal Oak is a heritage listed building of local significance. It is a two storey rendered brick corner building with decorative parapet, label moulds to windows and a simple awning. The current façade, which is in Victorian Free Classical style, dates from 1886. It is one of the few hotels in the local area that never possessed a verandah, with the current awning only having been added in recent years. During the 1960s and 1970s, a side door in College Street still led to the ladies parlour. Here's the our members favorite photos of "Pubs and Bars in Sydney". Upload your photo of Royal Oak Hotel! Category:Pubs and Bars in SydneyHelpful Links:Sydney Overview References: 330865, 1865187 Claim:If you are the owner of this property claim it?